It’s time for another baby quilt. I really hope that someday I get these done before the babies are born! After the sparkle punch baby quilt I made in February, I really needed to find something that would come together quickly. I thumbed through Camille Roskelley’s book, Simplify, and settled on the Little Man pattern. 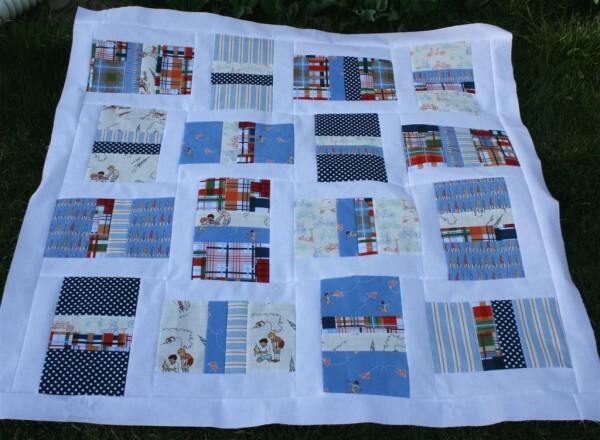 The pattern calls for just 4 fat quarters and a neutral, making it a simple and inexpensive quilt. I already had a small stack of fabric chosen and I used 7 different fabrics instead of four, using one fabric twice to make the pattern work. I also added a white border around the entire quilt instead of borders at just the top and bottom, making it a square quilt. The project came together in just a few hours and the bright happy colors are making me smile! 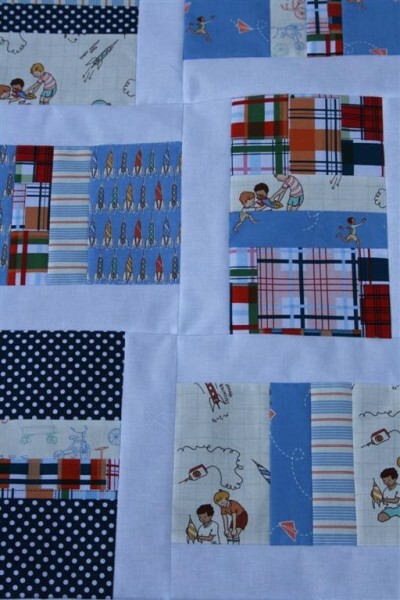 Most of the fabrics I used are from Sarah Jane’s Children at Play collection. I especially love the little boys building rockets. 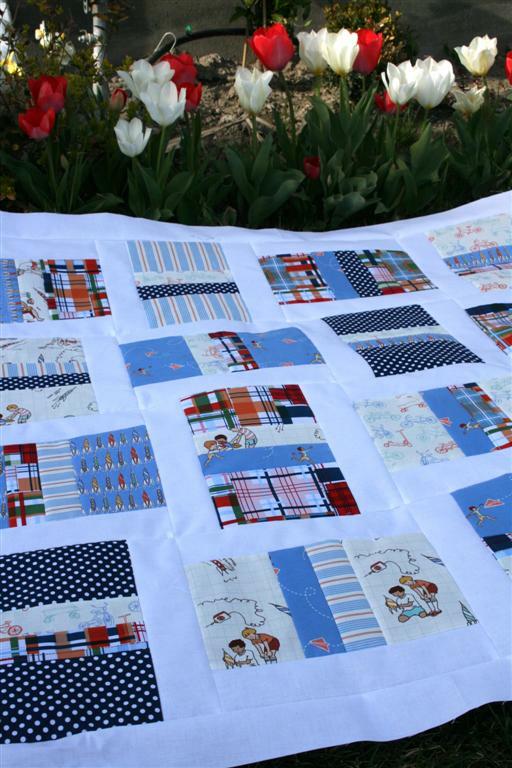 I also used my all-time favorite plaid from Emily Herrick’s Going Coastal collection (wish I had an entire bolt of that plaid) and a navy polka dot print from my stash. I’m very happy with the depth and contrast the plaid and the polka dot add to the composition of the quilt. I feel like they prevent it from being too soft, making the quilt better for this new little boy who is the youngest of seven children. Now I need to settle on a backing and get quilting! I must say that this pattern was delightfully simple and fast, which means I will be revisiting it for future baby projects, both girl and boy. I highly recommend it.